Resorbable, synthetic bone graft blocks with a highly interconnected porous matrix. ReproBone® blocks are indicated for use as bone graft substitutes for the repair of non-load bearing aseptic osseous defects. Over 80% porosity allows rapid bone ingrowth throughout the interconnected porous structure. 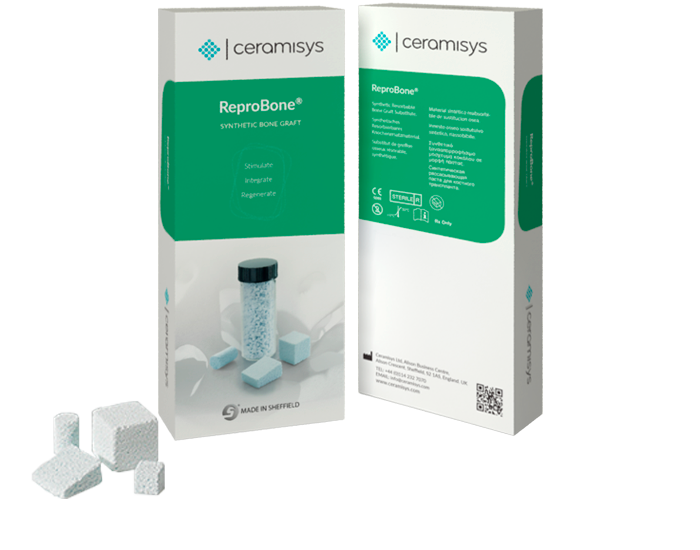 ReproBone® blocks maintain bone volume throughout the whole repair and regeneration process. They provide support without significantly limiting natural bone density. The microporosity within the HA/ß-TCP structure assists the transfer of essential nutrients. Osteoconductive scaffold supports early vascularisation and rapid bone regeneration throughout the implant. With a composition similar to the mineral component of human bone ReproBone® undergoes complete resorption at a controlled rate. ReproBone® is available as blocks, wedges, cylinder and disc with a large range of convenient sizes. They can be easily shaped with surgical instruments to more closely fit the bone defect.